The Chinese zodiac horse and snake compatibility is yet another relationship with a strong tendency towards opposites. It could be simply another case of not understanding the other’s needs or it could be more that. There is a miscommunication issue that doesn’t give them a fair chance. Either way, putting in some work could show some real payoff in a satisfying horse-snake relationship. Those born under the Chinese zodiac sign of the horse are naturally energetic individuals. They love to travel and are very much loners a lot of the time. They need nearly continual activity to feel satisfied and due to this tend to be far more unsettled than the snakes. They tend to regard their partner’s more lush way of life as being apathetic or careless. The snake man or woman tends to enjoy being home and the comforts found therein. They will typically become restless over their lover’s behavior. They will find the male or female horse’s incapability to put down roots tiring and they will not be able to tolerate their constant need to move onto something new. Most people wouldn’t naturally put the horse and snake soulmates together. If these two vastly different Chinese zodiac signs manage to create a relationship by sticking around long enough, they are going to most probably disagree on a lot of things. Horses are known for being seductive and great at roping people in. However, the snakes have their own sensual and provocative nature. The horse could very well be intensely attracted to the snake and start dating. While the horse will come on earnestly and energetically in the beginning, their interest will wane after a while. They will see their lover as being somber and low-key. Meanwhile, the male or female snake will have already formed a deep connection with their partner. The snake can be very envious and greedy when it comes to love and a horse doesn’t appreciate those kinds of emotions. This also means that when the horse man or woman loses interest and wants to move on, the snake is going to take it rather hard. This could sometimes be the reason for their breakup. Both the horse and snake in love have an inferiority complex. However, instead of the two commiserating over their inner turmoil, they both overcome this complex in very different ways. The horse moves continually and the snake uses an affinity and charisma. In bed, the horse-snake couple will not be able to sexually satisfy each other, even though both are sexually appealing signs. Horses are headstrong and want independence and change. They however, rarely look to the future and focus more on the here and now. They will usually be found to be impetuous and illogical. They could find the snake to be too dogged and discriminating. According to the Chinese horse-snake compatibility predictions, both come from and live in very dissimilar universes. Their personalities are nothing alike, making a deep connection difficult. Without the possibility of a deep connection, this kind of relationship is not gratifying for either party. Snakes will be careful and look to the big picture, with most of their goals residing in the future. They tend to be persistent in whatever they put their mind to. But they will see their lover as being immature. They don’t typically embrace change. Because of this they can actually dislike their lover for their carelessness and egotistical actions. Both of these Chinese zodiac signs are bright and rational and yet they just can’t seem to play well with each other. For the horse and snake love compatibility to work, even in the short-term, both parties would have to go against their natures and show some serious lack of selfish attitudes. 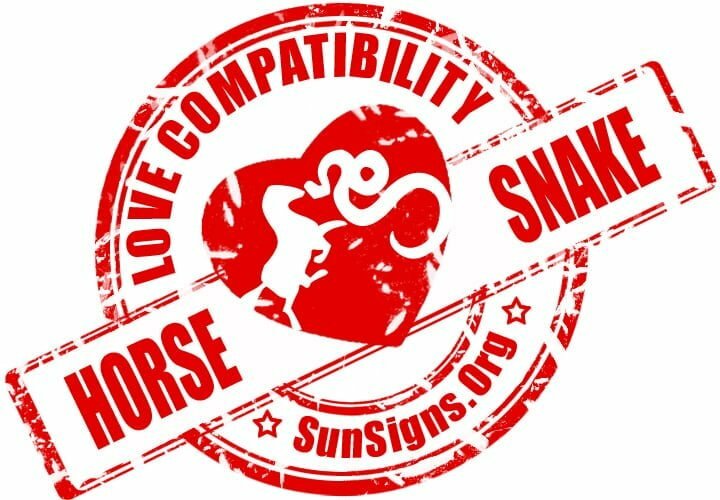 Horse & Snake Chinese Horoscope Compatibility Rated 2 Hearts!